The UniQue 4 disc DVD cases come in a 5 pack . The case’s primary purpose is to securely hold four different media discs. To do this, there are disc slots on the inside of both covers, which holds the first and the last disc, assuming your four disk product has sequential order. The second and third disks are secured on a hinged, middle tray that has a disc slot on both sides. 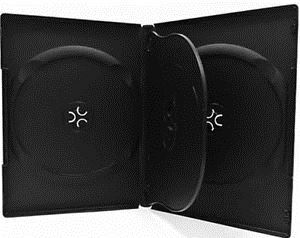 These specifications combine to create an effortless experience in accessing any of the four discs upon opening the quad DVD case, which opens and closes like a book. In addition, the case contains a clear plastic overlay wrapped around the outer faces to serve as slots for inserts to meet your customization needs. Finally, the DVD case is made from recycled polypropylene. This means that while it will be sturdy enough for hands-on applications, it should not be used in conjunction with automated packing machines.